ON Semi says that for the past five years, every movie to win Oscar Award – Hugo (2011), Life of Pi (2012), Gravity (2013), Birdman (2014) and The Revenant (2015) – was captured using an ALEXA or ALEXA 65 digital camera system from ARRI. For 2016, four of the five nominees for Best Cinematography were again captured using ALEXA cameras. These cameras high DR, natural color reproduction, and high sensitivity, all begin with the performance of ON Semi image sensors used in the system. 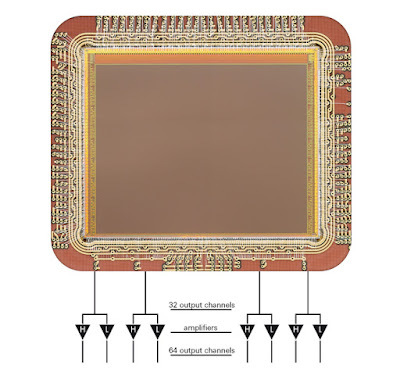 "Although the science behind the breakthrough performance of ALEXA's custom designed CMOS sensor is complex, the use of large photosites and a Dual Gain Architecture are its two main principles. By employing unusually large photosites (in today's world of tiny cell phone sensors), ALEXA's sensor exhibits high dynamic range, high sensitivity and low crosstalk. The larger a photosite is, the more light it can capture and the lower the noise. The Dual Gain Architecture simultaneously provides two separate read-out paths from each pixel with different amplification. The first path contains the regular, highly amplified signal. The second path contains a signal with lower amplification, to capture the information that is clipped in the first path. Both paths feed into the camera's A/D converters, delivering a 14 bit image for each path. These images are then combined into a single 16 bit high dynamic range image." Assembly seems to me quite tricky, looking at the large amount of bondwires and distances covered. Why is it that Arri is basically still unrivaled by other companies? Is it in the inherent features of the sensor or is it just clever in camera color-processing that delivers something that film makers really love? We played around with an Alexa mini for about a month in the off hours and we couldn't break the image or the colors in any way.. it took us minutes to break the image with REDs or Sonys. Did you compare the specifications of Alexa mini with the other cameras. How are you sure that no toe/shoulder was applied to the "RAW" output. Red Weapon uses much smaller pixel. Alexa (mini including) has a SWAP (size weight and power) significantly larger than RED/Sony. Needless to say who does more processing. Like everything camera system is a trade off based on product requirements. Different aspects of camera performance appeal to different people. Beautiful images are credit to the photographer who knows how to use his/her camera. OTOH one can always get images from each camera and claim it broken. An odd Article, for this Site. It seems to promote "Marketing" over fact (or lack of Fact Checking and Proofreading). The Link to OnSemi contains this text: "And what powers the performance of these cameras? Image sensors designed and manufactured by ON Semiconductor. For 2016, four of the five nominees for Best Cinematography were again captured using ALEXA ...". 1. OnSemi didn't design or manufacture the Sensor. 2. Being a nominee for "Best Cinematography" means that the Camera Operator is good, not that the Camera is good (I'm not saying that means the Camera is bad, misreader or word twister). In 2011 Cypress sold its Sensor Division to OnSemi: http://www.cypress.com/documentation/other-resources/image-sensors-product-divested . The ARRI Cameras are more about the 'Secret Sauce' (Hardware and Color Science) than their 1/2 dozen year old Sensor Technology: http://www.arri.com/camera/alexa/technology/arri_imaging_technology/image_processing_hardware/ - Color Sauce: SMPTE RDD 30:2014 and RDD 31:2014 and 3D-LUTs: http://www.arri.com/?eID=registration&file_uid=16643 . So it's not at all that OnSemi should take credit nor are ARRI Sensors (some like the A3X are not even a single Sensor) the "best" - it's a combination of things, or as ARRI calls it: "
They got a Sensor made for them, placed it in a well designed Box, with great Hardware and Software, even rehoused Hasselblad Lenses. Studios use Panavision and obviously one Studio (at least) uses the CineAlta, the REDs and even Pany's VariCam also play a role. ARRI simply came up with the 'best' everything system, not the System with the best of everything. It's like the Canon vs. Nikon war of half a dozen years ago (because recently Canon has been ahead) - neither makes the Sensor (which makes it "best") but each makes the complete System which various Camps prefer (and invest or get locked into). If I had to choose a Sensor I believe I'd suggest CMOSIS, e2v, or Sony before I'd suggest Cypress; though OnSemi could come up with their own "better" Sensor soon enough. Without Global Shutter it's just a mess, without Dynamic Range it's monochromatic and without deep Wells or 8K worth of large pixels on at least a 35mm sized Sensor it's just noise (exaggerating in that last paragraph to make the point).